Track does not lie. Watching our children compete with the Knoxville Track Club, I learned this important lesson. An athlete needs to have substance, and coaches need to be proficient in their strategies. All the smoke and mirrors in the world will not change an individual’s time or measurement. Likewise, leaders emerge and falter by the examples they set before the team. Jim Kouzes and Barry Posner, authors of The Leadership Challenge, evaluated over hundreds of high performance organizations to determine how they were successful. One of the ingredients was managers ‘model the way.’ In fact, leaders set the right example. I saw this example symbolized in two athletes at West High School. The West High School Track Team has built a solid name for itself, with All-American hurdler Jackie Coward at the helm. While many people around the area figured West would faded into the wilderness with the graduation of Coward, West got better by creating a talented and deep squad. Coach Mike Crocket and Coach Greg Allen led a group of young and gifted athletes who were inspired to compete for a state champion. Over the last decade, the girls track team has been pretty amazing: 2006 AAA State Champion, 2007 AAA State Runner-up, 2008 Champion, 2009 AAA State Runner-up and 2010 AAA State Champion. Yet, I attribute their success this year to the two team captains, Aurielle Sherrod and Patavia Lowery. 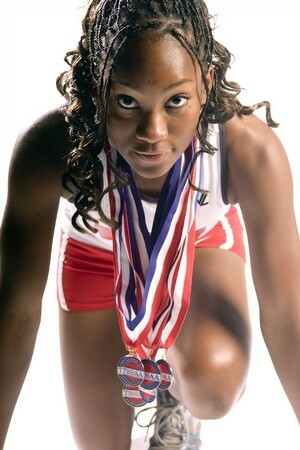 Going into her senior year, Aurielle was one of the top sprinters in the state. In the early track season, she got a hamstring injury: “I knew it was really bad.” It would hamper her all season. In fact, it was questionable how she would perform at state with little practice. The critics were wrong. Aurielle won the 100 and finished seconded in the 200 meters. She also led the Lady Rebels to wins in the 4 x 100 relay and a second place finish in the 4 x 200 relay. She refused to let her setback prevent her from success. She was voted the Prepxtra Female Track Athlete of the Year. With a 3.9 GPA in high school, Aurielle heads to University of Alabama – Birmingham on an academic scholarship. Patavia could be the mascot for overachievers. Since 7 years old, she competed with the Knoxville Track Club and has been characterized by her hard work ethics. Entering high school, her goal was to make it to state. Unfortunately, things didn’t happen as quickly. It would take her junior year to make it there. Loaded with a host of unproven talent, West High was looking for something special. At state, Patavia won the 800 meters, anchored a bronze finish in the 4 x 800, and helped provide West with another dominated performance and its 3rd State Championship. At the annual Knoxville Sports Hall of Fame Banquet on August 5th, she was selected as one of the Knoxville Sports Hall of Fame’s Athlete of the Year. Patavia will be joining South Carolina State University on a full track scholarship and will bring her Tennessee work ethic to this program. Clearly, these ladies set the example for excellent at West. The team responded. Sadly, many managers are unable to inspire today’s workforce toward greater performance. Manager guru Peter Drucker argued for several decades that managers must understand their employees as well as their customers. Few executives listened. Drucker concluded, “Business tends to drift from leadership to mediocrity. And the mediocre is three-quarters down the road to being marginal.” Yet, emerging leaders need to know how to rekindle such emotions in the workplace. Setting an example is one of these keys. How do leaders foster the proper examples in organizations? Credibility consisting of trustworthiness, expertise and dynamism is the foundation of leadership. It’s universal. It’s more difficult to earn and maintain the credibility especially when organizations are in multicultural environment. Managers need to go extra miles to gain credibility from subordinates or bosses who are from different background. For example, when Toyota came to the U.S. to build the very first automotive plant, can you imagine how those Japanese managers were perceived and trusted by American workers? The challenge can be language barrier and cultural difference of how to communicate. (1) Credibility and trustworthiness occur through personal contact and effective interpersonal communication. A responsive leader is perceived as more credible and trustworthy as compared to a relatively non-responsive leader. The effective interpersonal communication may not have been perfectly established due to the language barrier. Despite of the communication challenge, what may have contributed Toyota to be successful leading the automotive industry globally is their expertise and passion of building quality cars. Noriko, good points on the global front!!! The ability of the United States to be competitive in the global economy is viewed by many experts as a major factor influencing the ability of the United States to maintain its economic growth and standard of living. Scientific and technological advances can further economic growth because they contribute to the creation of new goods, services, jobs, and capital, or increase productivity. One question is whether or not the United States is educating enough Americans with sufficient STEM education today to meet this projected future demand. Abraham Lincoln once remarked, `The best thing about the future is that it only comes one day at a time” Of course Lincoln lived in an era when steam engine slowly transport people and goods from sea and strategic sources of supply consisted of the nearest mines, forests and farm. But in our just in-time business world, a mere fraction of a day can mean all the different between success and failure. The results showed that organizations generally considered themselves successful at global outsourcing. However, while they achieved significant improvement in organizational effectiveness, they were not achieving the order of magnitude improvements ascribed to global outsourcing.